Ron's Log: Desert Hot Springs Planning Commission - June 13, 2017. Desert Hot Springs Planning Commission - June 13, 2017. Commissioner De La Torre was absent and one seat is vacant, so there were just three commissioners present. Over the years I've heard a lot of reasons why nothing could be done about this building at 11940 Palm Drive which I have considered the worst eyesore in the city since I moved here, 13 years ago. Black mold so serious that the only complete demolition could deal with it. Demolition couldn't be immediate because cellphone towers on the roof would have to be moved. We can't locate the owners. As the Inland Empire's largest dovecote, we would have to get permission from the US Department of Interior to kill all those birds. Okay, just kidding about that last one. Evidence that the city at least sicced Code Enforcement on the building in 2010. There was some improvement in the property following that. Turns out none of that is true. All the building needed was an investor willing to pour money into it, and we've got one now, thanks to marijuana! The matter of a conditional use permit for that building as a medical marijuana dispensary came before the Planning Commission last Tuesday night. The applicant (Stephanie Bodde and Desert Hot Springs Dispensary) had previously applied for a CUP for a dispensary at 66406 Pierson. That application was turned down at the March 8, 2016, Planning Commission. The main issue was lack of parking and the fact that nearby Rose Mortuary also objected to it. I thought that was the least we'd hear of them, but they went and found a better location. There will be no other tenant in the approximately 6,000 s.f. building. The site has 20 parking spaces, two more than the minimum required. Entrance and exit will use the east entrance. The north and south doors are for emergency use only. Most of the second floor will go unused. Chair Voss said that some residents may be concerned that too many dispensaries are concentrated in this area, but he went on to say that every dispensary in town moved into a substandard building and improved it. I think the two dispensaries in the Mission Lakes shopping center are pretty obvious exceptions to that. The IVTHC dispensary at 11555 Palm Drive opened in a fairly new building. But he's right about all the others. He wanted to make some changes to the external appearance of the building at 11940 Palm Drive to make it look better. He likes the new paint color that you see on the building now (brown), but he wants one additional color to be used, so it isn't just one big blob of brown. He would like to see more landscaping. He would like to see window treatments with wrought iron, and rock treatments on the exterior. He said he was going to leave the details of these matters to be hashed out between the applicant and city staff. The chainlink fencing will be removed (of course) and Mr. Voss would like to see a combination of block and wrought iron wall erected. Commissioner Larry Buchanan said the building was erected in 1985 by Jack Webb for his real estate office. The city approved the Ho Ho Express Private Fueling Station to be located on Little Morongo south of Dillon a couple of years ago. The project has been delayed because the Coachella Valley Water District required them to build a 1½ mile water line. They were before the Planning Commission only to get a one-year extension of their entitlements. This was approved unanimously. That Distribution Center to be constructed on the east side of Indian between 18th and 19th is still identified as a "Distribution Center" on city paperwork, even though the site will now be marijuana cultivation. Originally approved by Riverside County, several time extensions have been granted the project. This evening they came before the Planning Commission seeking another extension to November 2017. An extension will keep their mitigated negative declaration valid, so they can avoid having to go through a CEQA process. Approved unanimously. Another marijuana cultivation project, Desert Grow, to be located on the north side of Palomar Lane in a site that has not been previously developed was approved 2-0-1 with Commissioner Buchanan abstaining. Still another marijuana cultivation project, Din Cultivation, will be located on the southeast corner of Palomar Lane and Little Morongo, also previously undeveloped. This one was approved 3-0. For a change of pace, the Commission then took up a proposal for a marijuana cultivation facility, Kim Cultivation, on undeveloped land on the north side of Palomar Lane, but further east than Desert Grow. This was approved 3-0. Next, to really mix things up, the Commission considered a marijuana cultivation project located not on Palomar Lane. 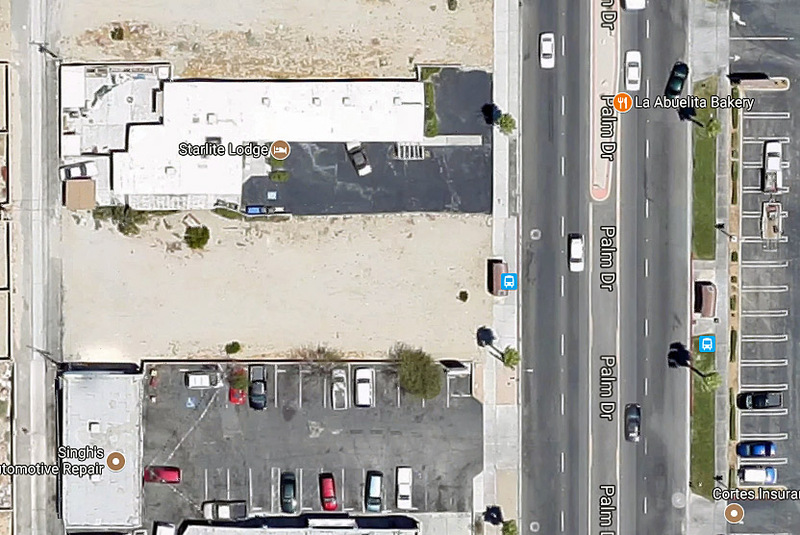 This one, MIRO, LLC or Desert Springs Cultivation, will be on San Gorgonio Lane. Approved 3-0. Victor Muñoz brought a proposal for the Starlite Lodge Motel to the Planning Commission. 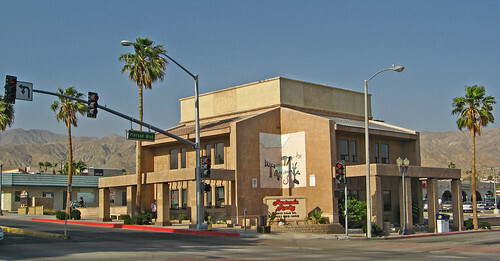 The Starlite Lodge Motel is located on Palm Drive, a bit south of Hacienda, across the street from the Stater Bros. parking lot. He proposes to remodel and expand the existing one-story building and erect a new two-story building on a parcel south of the one-story building. The bus stop located there will not be moved. The developer says that they expect to do well because there is no motel in that area, and it's close to a lot of restaurants. That motel at Palm and Ironwood which has been undergoing incremental improvements for years does not seem to be a competitive threat. The next item was a proposal to allow Post and wire fencing, not to exceed 48 inches in height, \along the perimeter of vacant property. "Post and wire," I take it, is legalese for chainlink fencing. The intent is to discourage illegal dumping on vacant parcels. Approved 3-0. 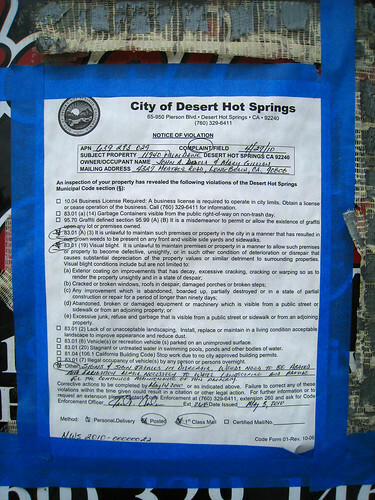 DHS Properties which already has approval for a marijuana cultivation site on Two Bunch Palms Trail returned to the Planning Commission only to get an amendment to their Development Agreement to permit extraction and manufacturing at the location. Approved 3-0. Commissioner Romero asked if there is a moratorium on new residential construction in the Hot Water Overlay zone. Community Development Director Daniel Porras said he doesn't think there's a Hot Water Overlay zone (see, he's still new), but he would find out if there is a moratorium. Mr. Porras thought she had it confused with the Spa Zone sign toppers.